Your roof makes an impression on your customers. The exterior of your building plays a huge role in the first impression customers make about your business. If the roof is looking shabby or it’s leaking on the inside of your building, they aren’t going to have a good first impression of your business. Customers who see a run-down building are going to think that you either don’t care enough about your business to make the repairs or your business isn’t good enough to be making enough money for the repairs, so they should be shopping elsewhere. While neither of those things is probably true, that’s what a bad roof could be making them think. Delaying repairs can end up costing you more. The longer you wait to call for professional commercial roof repair, the more expensive the work is probably going to be. That’s because the longer you wait, the more damage can spread through the roof and harm the internal structure of your building. You can end up with pest infestations, water damage, and more, all of which will need to be dealt with before the roof repair work can actually begin. It’s more labor intensive and involves more materials, and that means more money out of your bottom line. Water stains on your ceiling. This is the most obvious sign that there is an issue somewhere with your roof. These stains will be very obvious, especially if you have a drop ceiling. The staining is usually a brown color and quickly spreads if left unchecked. Signs of damage during a visual inspection. If you are up on your roof, take a minute to look around. If you see any tears, blisters, or cracks in your roofing, that’s a sign there has probably been some damage done to your roof that will need to be repaired. There are soft spots on the roof. When you walk across a flat commercial roof, it should feel firm and sturdy. If you encounter any soft spots, that’s most likely a sign that water has gotten under the membrane of the roof and has started to rot away an area underneath. Damage to the roofing membrane. Whether it’s a storm, vandalism, or something dropping something up on the roof, damage to the membrane should result in a call to a roof repair team. That’s because the membrane is the primary line of defense for the roof to keep out water and other elements. Standing water on your roof. Some water is considered normal, but it should evaporate in a day or two. If it doesn’t that could be a bad sign. A commercial roof repairman will be able to determine what’s preventing the water from draining or evaporating and ensure that the standing water it’s getting into your roof. 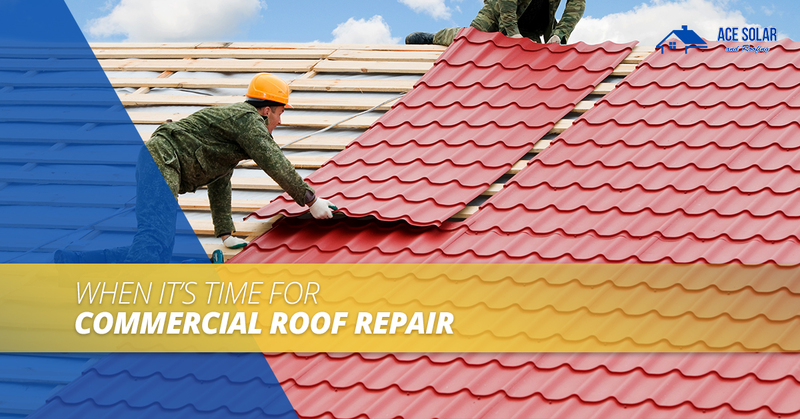 Do you think your commercial roof might be in need of some repairs? If any of these signs seem familiar, it’s time to get in touch with Ace Solar and Roofing and schedule an appointment for roof repair today. You can call us over the phone or contact us through our website to schedule an appointment. We offer free roofing inspections as well as roof repair, installation, and maintenance. Let us get to work on your commercial roof today!